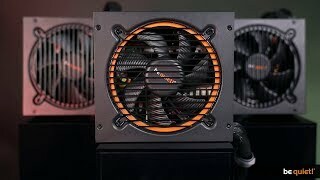 PURE POWER 11 | 400W CM silent essential Power supplies from be quiet! Pure Power 11 400W CM offers peerless dependability and best-in-class features. Whether you’re assembling a very quiet system, upgrading an existing PC, or building a multi-GPU gaming system, your build will benefit from this PSU that simply has the best combination of features at a very popular price. Pure Power 11 CM offers 400W of continuous power with two independent 12V rails for signal stability and two PCI express connectors for multi-GPU systems. It is suited to very quiet systems, for upgrading or building multimedia or multi-GPU gaming systems. Pure Power 11 400W CM is certainly eye-catching. The modular cable management is enhanced with premium black, sleeved cables. The flat cables used for the PCI-express connection and drives simplify installation as well as keeping the system tidy. You are already using a be quiet! 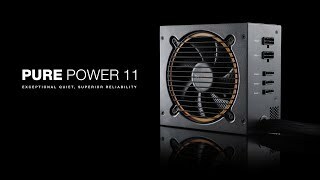 power supply and want to upgrade your system with a new PURE POWER 11 | 400W CM ? Check here which cables are compatible and don't need to be replaced.